It has been a little less than a day since Disney announced that they had acquired Lucasfilm for $4.05 billion and that a new trilogy of Episodes 7-9 will begin in 2015. And now after hours of sitting in silence, the person you have been waiting to hear from finally speaks up on the matter: me. I was so absurdly obsessed with Star Wars in grade school and middle school that I actually thought it was cool to be obsessed with Star Wars. I couldn’t get enough of it, anything that had the words “Star Wars” on it was automatically better: books, toys, Pez dispensers, video games – anything. Basically I’m saying that George Lucas owes my parents a debt of gratitude for financing his franchise. I was most definitely the target market in mind when The Star Wars Trilogy: The Special Edition hit theaters in 1997 and again in 1999 with Star Wars Episode I: The Phantom Menace. I was 11 when the first prequel came out, and I think that most of my generation of fans would agree that as they grew into young adulthood they realized what most people past puberty had known from the start: the Star Wars prequels kind of sucked. This is not going to be an argument about those films, or the TV series it spawned. Love them or hate them, fans had some indication that the prequels were coming almost 20 years in advance, with The Empire Strikes Back labeled as “Episode V.” So Lucas wanted to tell the story of Darth Vader before he went bad for three prior films. Fine, good. It made sense despite a poor execution. Series over. One would think. The fundamental problem with a new chapter of the Skywalker saga (if it is indeed about them) is not merely that it will be a continuation, but that it will be a continuation on film. The whole thing feels like a betrayal of the medium. For most of my life, pop culture phenomenons whether on film, TV or page have seen various incarnations and reincarnations – Star Wars included. Books beget TV, begets movies, begets video games, begets comic books and vice-versa for ever and ever amen. The mutability of the pop culture phenomenon is impressive because it allows for new takes on our favorite stories. By now Star Wars fans are used to the bastardization of their beloved films, in revisions, prequels and television shows. So it comes as no surprise that someone would continue the series after Return of the Jedi. The true crime of a new trilogy is that the story isn’t continuing in another medium like television or books, but in the format that we all initially experienced Star Wars: in the movie theater. George Lucas and Disney can’t take all of the blame however. The fact that something like this could even happen is in large part due to the entertainment atmosphere that we live in. 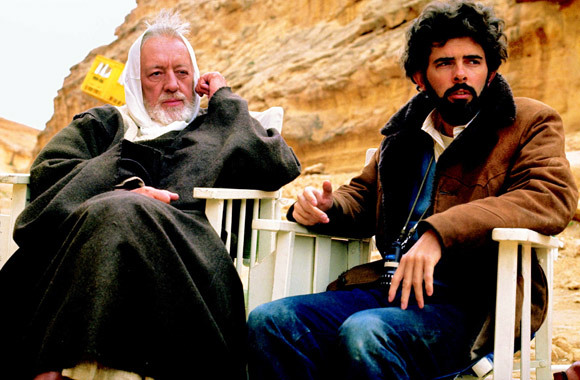 George Lucas merely took advantage of a consumer culture by changing his story into a brand. We can’t be shocked that more Star Wars movies are being added to a cinema ether that already contains more sequels, reboots and adaptations than can possibly be named in one article. 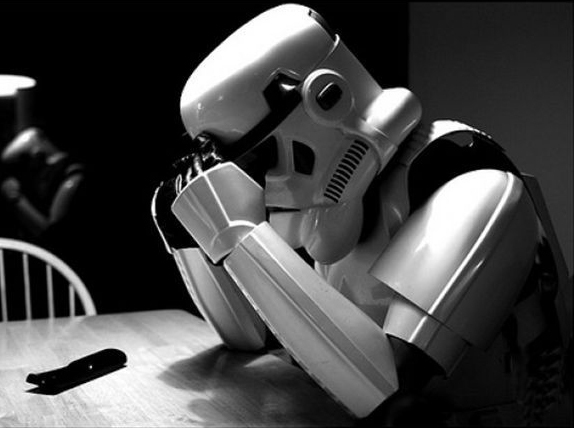 Despite all I’ve said, the new Star Wars films could actually be good, I’m not arguing that possibility. I’m merely continuing the same old (but valid) argument that critics have been making for years: a series of films that served as inspiration for generations of storytellers has mutated into just another corporate mascot. Shame on Disney, shame on George Lucas and shame on us. No beets for you Dwight. 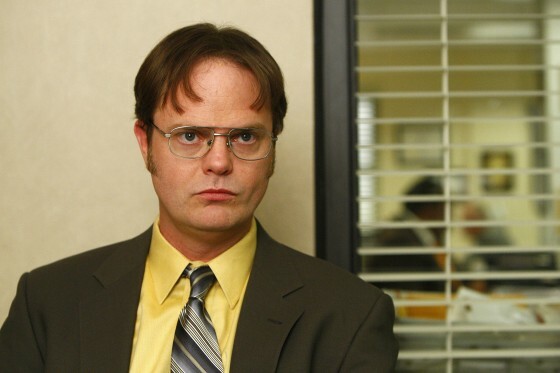 A Dwight Schrute-centered show would have been a disaster, TV fans know you can’t put the wild card of a show in the lead role (Joey, anyone?) 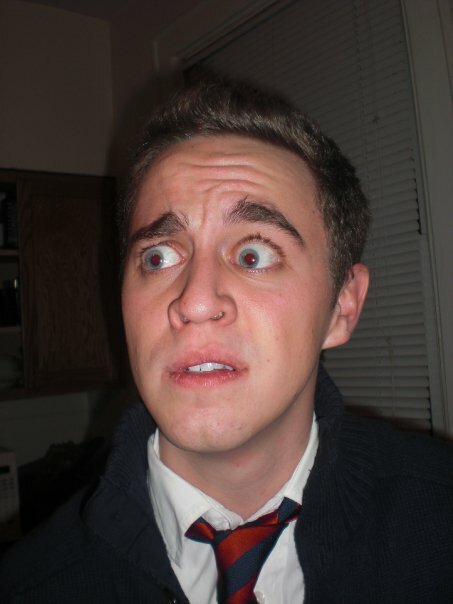 My roommate’s appraisal of NBC’s rejection was: “Good, at least NBC has half a brain.” Too true Nick, too true. Fans of NBC’s cult favorite Community would attest to that evaluation as well. NBC recently shelved Community, a show that was already given a late October start and a Friday night time slot. (UPDATE: See FACT CHECK below) It seems to be a good year as far as the network is concerned however. NBC is leading the ratings race in adults 18-49 and has given full season orders for their new shows Go On, The New Normal and Revolution. Good for business, bad for critics? We’ll see. 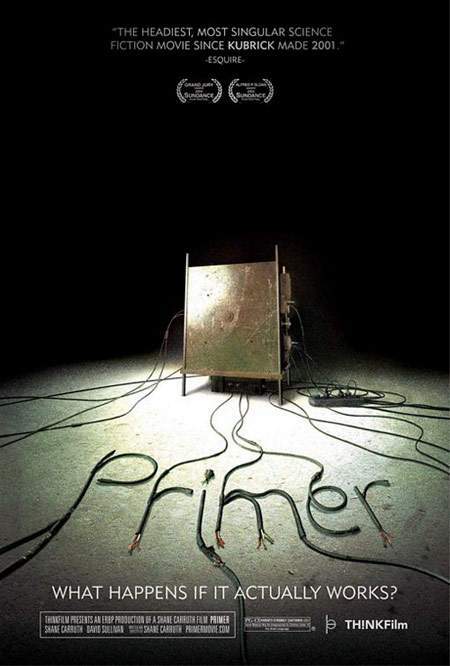 After being disappointed at Looper‘s halfhearted commitment to the time travel tale, I began looking into different movies of the genre and stumbled upon the 2004 film Primer, written, directed and starring Shane Carruth. Coming into the film I had little to no information on what Primer was like, only that most film critics praised it’s scientific application to time travel. Little did I know that I should’ve gotten a second opinion. Aaron, Abe and their two friends are engineers for a large company and spend their spare time tinkering and constructing tech for a profit in Aaron’s garage. After a minor disagreement, Abe and Aaron decide to work on their own project without their other friends. It appears that they attempt to build a machine that counters gravity, but soon realize that they have inadvertently created a time machine. The two friends decide to keep their discovery a secret and sit on it for a while; though Abe begins experimenting with the “box” on his own. Abe lets Aaron in on what he has been doing and the two begin to use time travel to their own advantage. They are cautious enough not to mess with larger scale events of the past and future, but instead increase their personal wealth by playing the stock market. Eventually Aaron and Abe get more adventurous and greedy with their time traveling, taking bigger risks that change their relationship forever. I knew about 25 minutes in that I wasn’t going to like this movie, the characters spoke in scientific babble which confirmed that my Left Brain shall never be fully utilized. I understand the concept of independent filmmakers taking avant-garde approach to selling their story, but Primer could’ve benefited from a little more direct exposition. Initially I couldn’t figure out for the life of me what Aaron and Abe actually did for a living, let alone what they intended their prototype to be (thank you internet.) 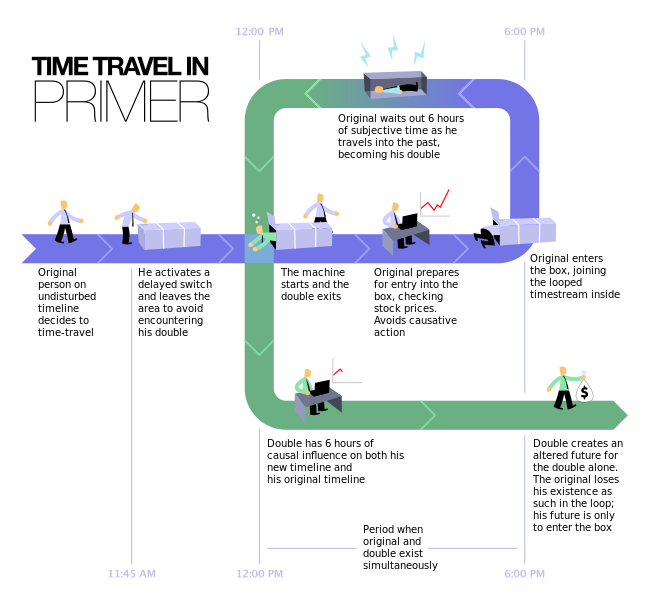 The time travel was also something that I couldn’t wrap my mind around – they set a timer, leave, blind themselves from the outside world and wake up in a box…? (See chart below) I knew my brain was going to hurt while watching this movie, but I thought it would be a good hurt. I am a big fan of Christopher Nolan-style reveals, misdirects and other types of mind-blowing plot turns, but none of Primer‘s felt earned or adequately explained. By the time Abe and Aaron start to try to change the past you can’t remember why they are trying to do it and more importantly you don’t care. Cormac Complaining: Yes, I Now Have a Facebook Fan Page. God Help Us All. All I want is for people to like me. And so, after many moons of debating the necessity of having a Facebook fan page and the egocentric implicitness of that action, I have created such a page. I will now join the hallowed halls of such pages as “Gym Hotties”, “Smoking weed make’s everthing better” and “Stop Alien Abduction,” so I shall be in good company. (Yes, you have my permission to click on those links to verify my claims, go ahead.) In the past 5 or so years I haven’t been big on commitment, in fact I take an odd sense of pride in the many things I have quit: plays, choirs, improv groups, fencing clubs, boxing clubs and stand-up comedy. But hey! I’ve been pretty active in my writing for a few months now, which is probably a good thing if I intend to eventually be paid for my writing in larger sums than “likes.” And by now I figure most of my casual acquaintances on Facebook have labeled anything with the name “Michael DeLaney” on it their news feed spam, so the time has come to take back my Facebook!…from myself. Thanks for liking my page, encourage your friends and family to do the same and you may even win a new iPad! Not from me mind you, but someday you may enter a contest and from that contest you may win a prize and said prize just may be an iPad. On that day, you may thank me. Behold, the latest change-up to my constantly shifting 3-2-1 Comics! Now with BIGGER PICTURES! 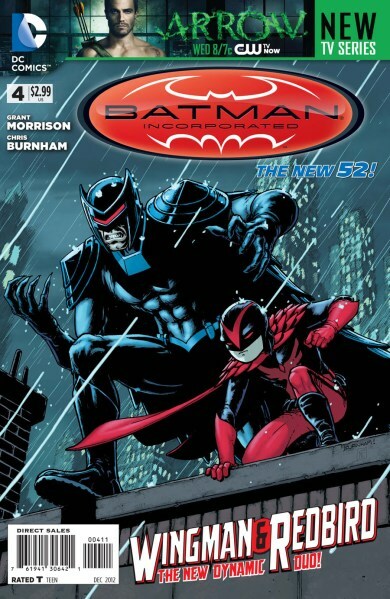 Batman Incorporated #4 starts off where #3 left us before all the zero month mess started – damn you zero month! Batman (in his Matches Malone persona) is under attack by the League of Assassins and Batman Inc. along with Damian’s new identity Redbird arrive to help him. It’s a fairly quick-paced battle that’s over before it’s started, and Morrison reveals the mysterious identity of the new Wingman. This was a good issue but not a fantastic one. Chris Burnham’s pencils have been improving on the series (Leviathan Strikes! being a high point) but this issue highlighted some of the artist’s faults, with a shaky look to the overall action and a curiously Asian-looking cast of characters. It was fun to see the whole team in action, along with pre-New 52 characters like Merlyn and Sportsmaster, but this issue felt like it reached its conclusion too quickly. I will admit that I’m a Lobdell hater, but I couldn’t pass up the much-hyped issue where Clark Kent quits the Daily Planet could I? 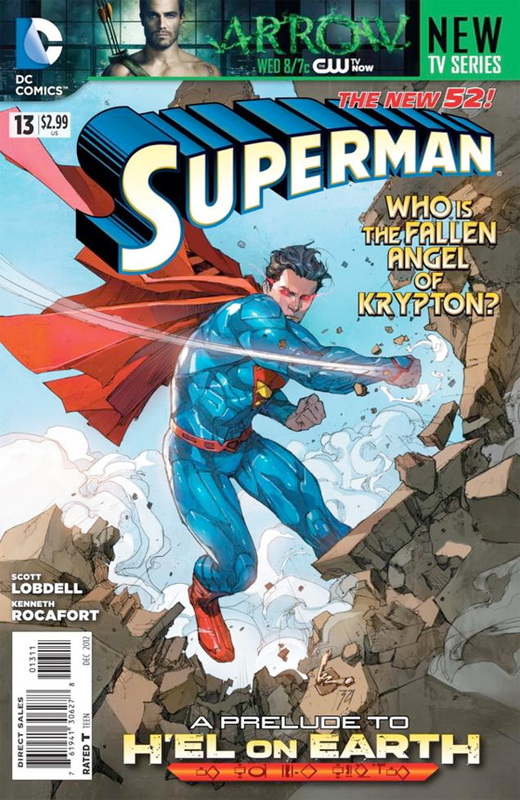 This month’s Superman covers The Man of Steel testing his powers, quitting his job and sets up events for Lobdell’s upcoming crossover “H’el on Earth” (Ugh.) Clark quits the Daily Planet to stand up for the integrity of journalism, which is a believable Clark Kent move. What is not like Clark Kent (or Superman) is the dialogue and thought bubbles that Lobdell puts forward. The superfluous thoughts that go through Clark’s head and the banter that Superman has during the fight reads like Spider-Man (the worst parts of Spider-Man.) Kenneth Rocafort’s art is ugly man, just ugly. I’ve got nothing else to say about that. 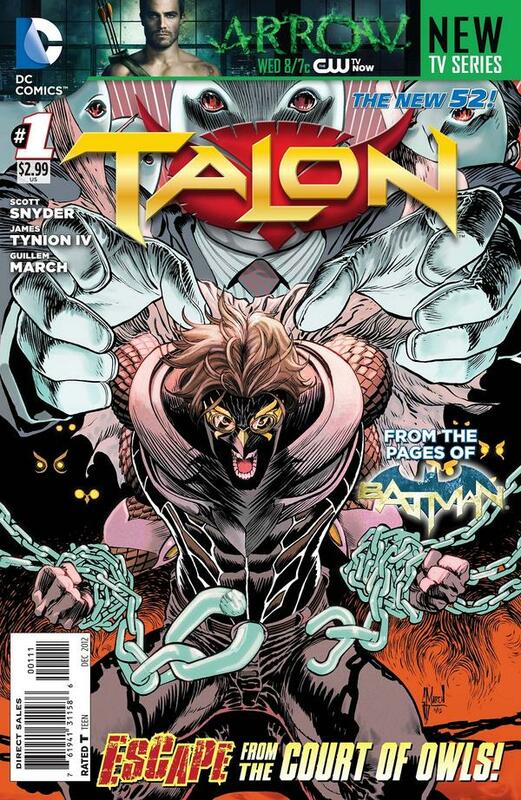 This issue marks the second appearance of ex-Talon Calvin Rose, whose origin was told in last month’s Talon #0. We see him returning to Gotham City for the first time to investigate if The Court of Owls is actually gone after tangling with Batman. Though Scott Snyder is really only a co-plotter, you can tell that James Tynion IV has learned the ropes from the guy. Its the attention to details about city landmarks and the history they contain that has Snyder’s fingerprints all over it. Guillem March does a good job pencilling close-up action, but when it comes to a broader, more distant angle he loses his focus and things become a little blurry. The “first” issue is a pretty standard setup for where the story will lead and what Calvin’s mission will be. After Snyder’s story of the Court of Owls in Batman, it feels like the faceless organization have lost their teeth. Hopefully Tynion IV can bring the mystery back to the Court. Matt Fraction and Larroca started their run on The Invincible Iron Man in 2008, and today it has come to an end. 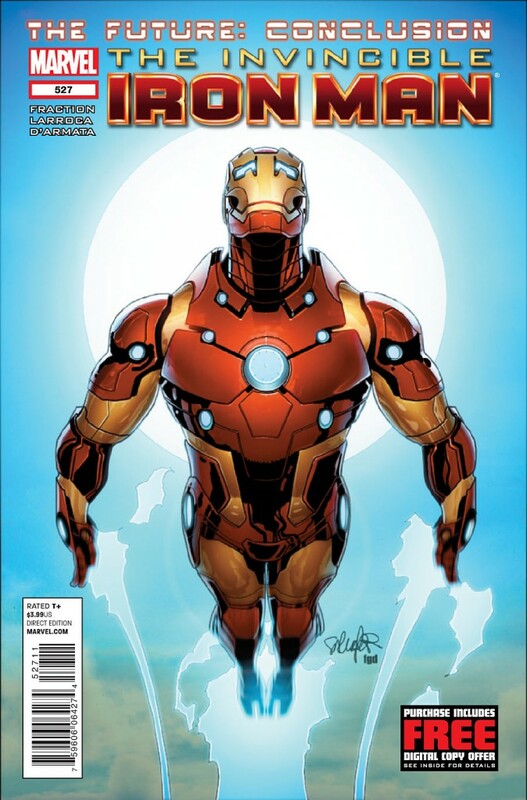 #527 serves more as an epilogue than a finale, since Tony Stark beat the bad guy (The Mandarin) in the previous issue. The issue ties up loose ends by from the past few months via character interaction and conversation, which has always been Fraction and Larroca’s strong suit on this book. I’ve been disappointed by the past year of this book, and though this finale wasn’t amazing it was satisfying in its’ own way. Fraction doesn’t pretend to have the final word on Iron Man, which is a smart choice. The character will live on and changes will be made from Fraction’s take, especially with the dawn of Marvel NOW! The finale of The Invincible Iron Man instead reaffirms that the more things change, the more they stay the same. Especially for comic books. The exploits of our Friendly Neighborhood Spider-Man leave me with nothing but boredom these days. It’s not that the stories are awful, but they are mediocre as hell. 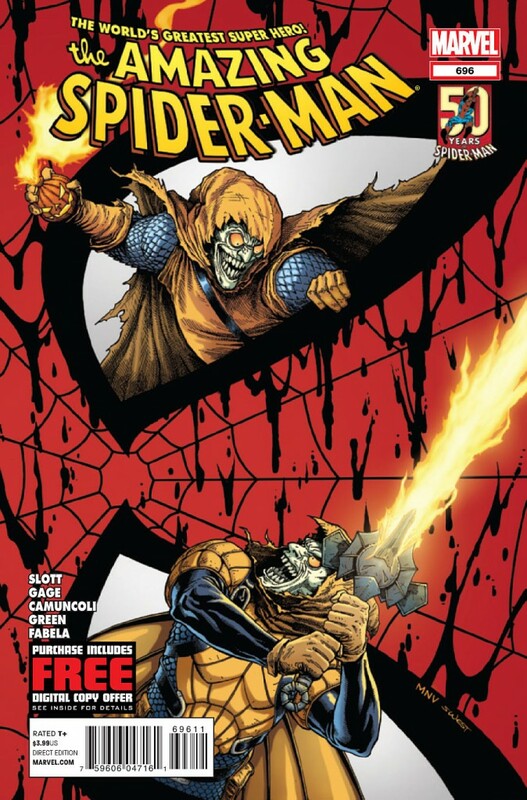 This week sees the second part of “The Danger Zone,” where Peter Parker’s spider sense is all out of whack while he is being held hostage by Hobgoblin and The Kingpin. The two villains want Spider-Man to deliver a briefcase in exchange for Peter Parker’s life, but Peter Parker IS Spider-Man! What ever shall he do!?! Plots like this along with the gratuitous exposition via thought bubbles are tropes of the 60s that are better left in a time capsule. Giuseppe Camuncoli does an adequate job at the pencils, though I couldn’t easily tell the difference between the two Hobgoblins in their fight, which I could not care less about. Invincible was a hell of a comic when it began, but lately has been spinning its wheels with its star character sidelined and focusing WAY too much time on a subplot involving ensemble members Robot and Monster Girl. Thankfully, this issue wraps up that story and spends a decent amount of time with the former Invincible and currently infirmed Mark Grayson. The hero has seemingly lost his powers, and Kirkman decides to spend only a minimal amount of time exploring how this has affected him. Ryan Ottley does the majority of the pencil work, with his sharply detailed figures that outshine Corey Walker’s pale and less defined ones. Similar to The Walking Dead, Robert Kirkman has been teasing that a big death is going to take place in Invincible 100. Horrible things are coming to Invincible, though maybe that’s a good thing for us.